I have been suffering from a severe repetitive strain injury (RSI) for quite a while, now. Since August of 2012, I've been unable to use a computer in any serious capacity via a keyboard and mouse. This might seem like highly personal information for me to be sharing on my public website, but this issue is insidious, poorly understood, and common among computer scientists and other heavy computer users. What's worse is that it seems like once you have chronic tendinitis, carpal tunnel syndrome or any other RSI, you can never truly be free of it. The various roads to recovery are peppered with terrible pitfalls and, despite your best efforts (and obedience of doctors' orders), it is all too easy to worsen your condition instead of improving it. Moreover, doing nothing might lead to sub optimal healing or, at worst, atrophy and degeneration. Since October 2012, this issue has shot to the top of my personal interests, and I am quite invested in discovering how to make a full recovery. I've since been to numerous doctors and specialists (GPs, physiotherapists, a physiatrist, an acupuncturist), read dozens of medical papers, and pursued many avenues that promise recovery. Unfortunately, it seems like no one truly understands my condition. Visit half a dozen doctors, and you will hear half a dozen distinct, and often contradictory, opinions. This doesn't mean that you should try to tackle this without the help of medical professionals. However, if you rely solely on their knowledge, you may wind up struggling for a long time with a condition that is at the fringe of medical knowledge. I intend to devote a fair amount of space on this site (and maybe branch off into another site) to providing a nice, clean distillation of what I've learned from these many sources, along with attempted explanations of the evidence that led me to my conclusions. If you are struggling with something similar, I would welcome your input, and your reactions to my thoughts. I would also like to hear your story, so that I can turn my page into a collection of recorded experiences, to further the state of knowledge of these conditions. With time, careful contemplation, and a bit of luck, I hope we can make a full recovery together, and lead future sufferers to similar success. From a technical standpoint, in order to be able to pursue my work, I've had to change the way I use computers dramatically. While I was trying to figure this out, I investigated many alternative computer interface options. Unfortunately, while most technologies I found had the potential to satisfy a very casual computer user, some of them were extremely expensive, others would just cause my injuries to migrate to different parts of my limbs, and the rest were not really "industrial-strength." I didn't want to spend $600-1,000 just to see whether a single piece of hardware would work out, and using the inexpensive or freely available technologies would make me far too slow to efficiently write and edit research papers, or even navigate my computer without serious frustration. In the end, I wound up developing some of my own solutions, which are exceedingly simple, inexpensive, and quite effective. I intend to publish a number of these things on my site, including the software I wrote, video and descriptions of the hardware I cobbled together, and a description of how to reproduce my LaTeX editing set up. My hope is that someone can take what I've done for LaTeX editing, and do it for programming in Java or C++ (since that is one area where my set up currently falls flat on its face). I know this is an Internet cliché, but expect further updates soon! After 14 months of pain, I've now been essentially symptom free for almost two months, and have been working at full capacity throughout that time (approx. 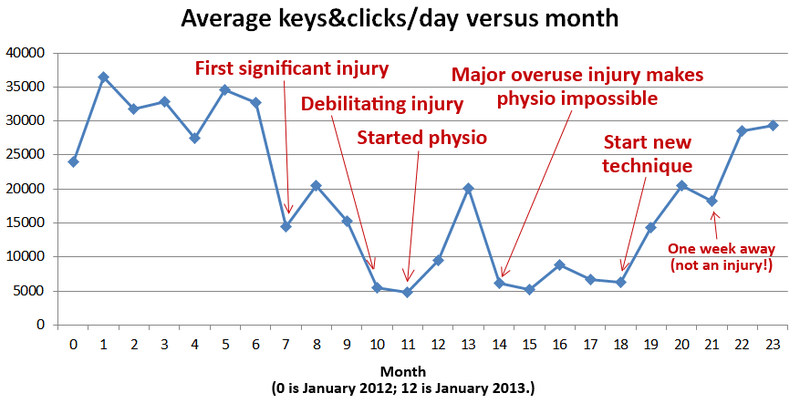 30k key presses & clicks per day). I think I now understand the pathology of my particular flavour of RSI, and how to fix it. As a teaser, I'll say that circulation (blood flow) is the largest factor. I'd like to write more about this soon, but, in the mean time, if you are struggling with a RSI that prevents you from using a computer as you would like, and you would like to hear about my recovery technique, please drop me an e-mail. I could use the motivation to dedicate time to writing about it. Here's a graph that shows how the activity level I've been able to maintain has changed each month over the last two years. Month zero is January 2012. I think it provides fairly good evidence that I've finally arrived at a good mental model of how this RSI works, and how to fix it. After four more months, I'm happy to report that my hand usage is still going strong. I'm basically back to what I love (playing Starcraft II every night and typing the days away), but there are a few caveats. First, I've had a handful of small relapses that have taken me out of commission for a day each. This usually happens when I've worked an unusually large amount over 3-4 days, and then had a long gaming session, and been too lazy to soak my hands in hot water before bed. This is still remarkably little trouble considering that I used to be taken out of commission for five days at a time, much more frequently, and by a MUCH lower level of work. Second, if I don't soak my hands in hot water before playing games, I injure myself pretty quickly. So, it seems like hot water is going to be a part of my daily routine for the forseeable future. I suspect the ultimate solution might be significant daily cardiovascular exercise to improve circulation, but I have yet to try that. (A stomach ulcer makes it uncomfortable to run and jump around for more than a few minutes, so I'm hesitant.) The third and final caveat is that I believe I will get injured if I lift heavy objects using my wrists (more than 10lb per wrist) for any prolonged period of time (more than a few seconds). I suppose this is just because I'd generally avoided using my hands to handle any objects heavier than a few hundred grams up until the last few months. I'm slowly starting to let myself lift larger objects. It seems to be okay to manipulate large objects as long as the time is very short and the muscle positions are very strong and stable (to avoid pulling and injuring muscles or tendons). For instance, to get some extra wrist strengthening action in whenever I'm moving around on a couch or bed, I intentionally lift my own body weight (~165lb) using my clenched fists (with straight wrists, fists pointing down). However, repetitive actions like washing dishes (especially scrubbing pans) can still sometimes irritate my wrists for a few hours. I'm guessing that this will go away if I resume exercising my wrists with things like regular dish washing, but I've been holding back because of its repetitiveness. Packing to move to a new apartment in the next two weeks is going to be a serious test of my progress. Here's a graph that shows how my progress has continued. The way I aggregated the statistics into months is a little bit different from the way I did above, so some data points might look slightly different. Well, it has been another 9 months. My hand usage is stronger than ever, but I'm still periodically having mild wrist pain. More and more, as time goes on, I'm thinking that the ultimate solution will be improving circulation. Nevertheless, I think it's safe to say that I've returned to productivity. Every night I soak my wrists and forearms in 109F water for 9 minutes, and that's enough to keep my problems at bay. If I stop doing that for two or three nights, then I'm in constant pain (whether or not I perform any repetitive activity). So, until I sort out the larger circulation issue, I'm just going to keep soaking every night. Here's another graph that shows how my progress has continued. So, it has been about two years since my last update. I'm still soaking my wrists every night for 11 minutes in a bucket of 110F water, and it's still working well. I'm not so sure that my problem is circulation, any more, although I think it's a factor. I'm starting to think that I might have some sort of inflammatory/arthritic condition, since it seems useful occasionally to apply cold, instead of hot. I think there is some value in learning to recognize when your body wants cold and when it wants heat. Once every couple of weeks, I have a slipup, and end up losing productivity for a day or two, but overall, I'm able to maintain a very high level of productivity. In two weeks, I'm flying to Israel for the next 6 months. I wonder how/if things will change in the hot hot heat. Here's a graph that shows my continued progress.